In order to get rid of mold in the basement, it's imperative to invest in an effective home ventilation- one that does not welcome mold, moisture, and musty smells. Allergens such as dust mites, pet dander, and pollens which irritate and promote respiratory illness. Airborne bacteria and viruses can lead to a wide range of ailments and infections that strive in damp, stale environments. Without ventilation, these bacteria continue to breed. Moisture is the main problem in air quality control. Uncontrolled moisture promotes mold growth, feeds thriving bacteria and causes structural damage to homes. Mold is a fungus, which needs moisture to exist, which gradually destroys the things it grows on. Spores released by mold can be highly toxic and can cause health complications. Toxic chemicals are the condensation and buildup of vapors from common household products such as paint, pesticides, cleaners, solvents, aerosols and adhesives that can be highly toxic if not taken care of by the right home ventilation. Ventilation using windows makes use of air currents, but this type of ventilation works only for basements with windows that are strategically placed and able to open and close. While this method conserves energy, it does require more work. Windows must be opened regularly and closed during times of rainfall or at night to prevent intruders from entering the basement. For best results, windows should be opposite each other across the basement space, following the natural drafts of the basement. 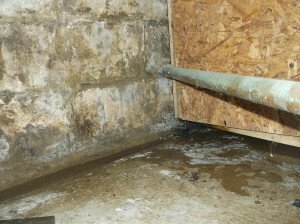 A wet basement needs additional ventilation, such as fans or a dehumidifier. If the basement stays wet, this method is most likely insufficient and a more mechanical system may be required. If you’re a homeowner in Rochester, Buffalo, or the surrounding area and have mold in the basement check out the EZ-Breathe ventilation system.